Complementing the cheap comfortable accommodation and helpful services the family run Hotel Alcyone Venice provides a unique strategically and highly advantageous location right in the centre of Venice. Situated on the Calle dei Fabbri the hotel is located between the Rialto Bridge and Piazza San Marco in the centre of Venice. Many of the fashion boutiques and monuments in the city are located in the Rialto Bridge and the Piazza San Marco. Arriving from Piazzale Roma at the Rialto vaporetto stop continue walking along the Grand Canal on the left bank away from Rialto Bridge for 100 metres. Cross one bridge and continue on the Riva del Carbon and turn right onto Calle Bembo. Continue walking straight down this street past the Goldoni Theatre. 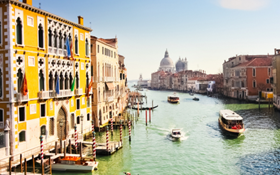 The street then becomes Calle dei Fabbri and you will find the Hotel Alcyone Venice located on your left. 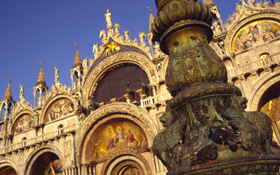 From Piazza San Marco take Calle dei Fabbri directly to the Hotel Alcyone Venice. After 3 minutes walking from Piazza San Marco you will find the hotel on your right. From the airport take bus number 5 to Piazzale Roma and then a vaporetto on line 2. Guests can also jump on an Alilaguna boat which offers direct public transportation to all the main areas of Venice and ports from Venice’s Marco Polo Airport. From Santa Lucia train station or from Piazzale Roma take a vaporetto on line1 or 2 and get off at the stop at the Rialto Bridge.